A hundred years ago this week… on July 1 the British and French Armies began an onslaught along a 25-mile front north and south of the river Somme, Gommecourt to Foucaucourt-en-Santerre. Part of an Allied strategy to co-ordinate attacks on all fronts, devised the previous December – though repeatedly replanned in point of detail – it had two strangely different outcomes. Of course, infamous in the UK memory is the "worst day in the history of the British Army", July 1 itself. 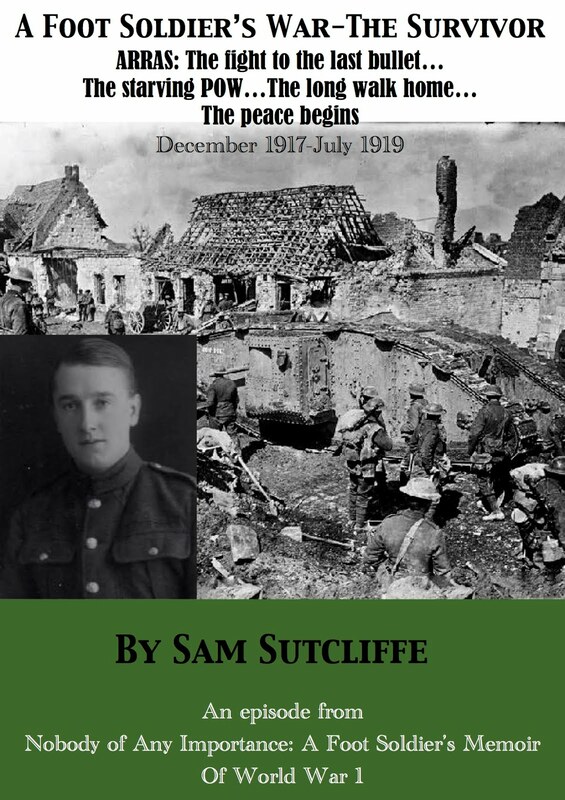 The 4th Army attacked between Gommecourt (see FootSoldierSam speaks, below, for my father's personal account from the trenches) and the Albert-Bapaume road, gained almost nothing and suffered 57,470 casualties (19,240 dead). Field Marshall Haig acknowledged this disaster the following day, by ordering the small gains at Gommecourt relinquished and, contrary to the wishes of the French commander General Joffre, redirecting some of his remaining forces to support the French Army – who had achieved a success since largely forgotten by their Allies, so overwhelmingly grievous was the British experience. Despite reducing their strength to reinforce Verdun, the French Fourth and Sixth Armies advanced up to six miles against the German Second Army. Casualty figures for the Somme are subject to much controversy among historians, but one standard accounting of the first day shows the French losses as a remarkably low (in the circumstances) 1,590 and German as 10-12,000. That same week the French also did well at Verdun, repulsing the Germans at Fleury (June 27) and Hill 304 (29) and recapturing Fort Thiaumont (30). Other Allied successes saw the Russian Army's Brusilov Offensive on the Eastern Front continue to prosper in Latvia and the Ukraine, despite German counterattacks; and the Italian Army pushed towards a conclusion its defence against the Austrian Strafexpedition, driving their forces north again with victories at Postina and Arsiero (June 27) and Pescala (28). Last week, Sam finally donned his extra stripe to acknowledge a (detested) temporary promotion to Corporal, he survived more hair-raising scrapes in No Man's Land at night, and was astonished and moved to see some school children at play just behind the front line. This week's blog covers the notorious July 1 – as ever, just from one man's point of view as my father stressed, asserting no wider knowledge than what he personally experienced. Brace yourself if you mean to continue, it makes grievous, painful reading. 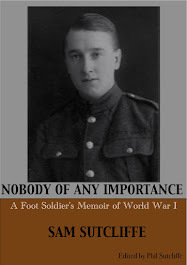 I would add that the editor's endnotes I include on the blog, and which are often of just passing, detailed interest, on this occasion are crucial to understanding what my father and his comrades did and endured on that day. ‘After a spell in that village, which appeared almost remote from the perils of war although within marching distance of the Front, we were once again to return to the trenches. Information circulated one afternoon, roughly 24 hours before we must depart*. We had been training for a few hours each day but, on our last day in this comparative little heaven, we were freed of all duties except really necessary chores. As evening approached, I felt the sadness of leaving this unexpectedly cosy haven. A final sleep on the comfortable wire netting, the packing up of all our bare requirements for survival up front, and our trek westward began. On the day – which followed a period of massive bombardment of enemy positions to destroy their barbed wire defences etc – our Battalion was to occupy the ordinary front line, and our most advanced trenches where my Platoon found itself. The support trenches behind us sheltered a kilted Regiment who would come through our line to start the infantry attack, at which our men in the front trench would advance over the German front trench – by then in the hands of the Jocks – and go on to take the German support trenches. Finally, from the advance trenches, we would pass over all those people and clean up and occupy the German rear positions. But Jerry must have also lost heavily in both men and morale; the German artillery gradually became less active and communication between scattered groups on our side more easy to maintain, so a front of some sort was re-established which could resist if not stop an enemy attack**. Meanwhile, the work of holding positions with a proportion of survivors, and allowing small parties to search for and bring in wounded men was organised by the remaining officers and the unshakeable RSM, who won praises from everyone who chanced to be near him during the battle***. Our Company – such as it was now, after its brush with hell – remained in what had been the front line. By dawn, most of us were ready to stop where we stood – crouched, rather – for under cover of dark we had searched for and found many wounded men, their chances of living diminishing with every hour in which they lay exposed with wounds untended. * The British Army’s Somme attack had long been planned for June 29. The order to postpone until July 1 came through on June 27. The Kensingtons, who had been in the line June 9-21 then rested, were ready to move out on the 28th, but remained in Souastre for another 48 hours until 8.25pm on Friday, June 30 ­– in case anyone’s confused, the various observations and anecdotes Sam mused on in the couple of pages after he refers to leaving the village are clearly from his various experience of the Front over the previous weeks. During this postponement, one extraordinary thing happened to the Kensingtons; the Brigade command replaced their Commanding Officer! On the 27th, says the Battalion War Diary, “Major HWH Young of (7th Batt.) Leicestershire regiment arrived with his batman”. The following day, “Temp. Lt Col WHW Young” (I don’t know whether the change of rank was the diarist’s mistake or an overnight promotion) took over as CO from Lieutenant Colonel HJ Stafford who promptly “proceeded on leave to England”. Young’s notes, attached to the Kensingtons’ WD by the National Archive, say he was rushed in by car from Étaples on the 27th – to Stafford’s astonishment. So Young went to Brigade HQ to seek an explanation. He was told the Battalion, being City boys, were “not good at digging”. Perhaps seeking a clue as to how a change of CO might effect an improvement in this area by July 1, he asked about Stafford; the Brigadier said he “knew very little” of the ousted CO – who’d led a Battalion under his command for five months. Young writes that he found this “an extraordinary statement”. Still, of course, he had to then try to get to know his officers at least, given they’d all convene on the battlefield within two days. Strange/interesting that my father didn’t recall this change at the top as a significant event from where he stood. ** Something odd struck me, as maybe it strikes you, about my father’s account of July 1, 1916, the first day of the Battle Of The Somme; at times, it’s as if he’s not a participant, but a remote observer. 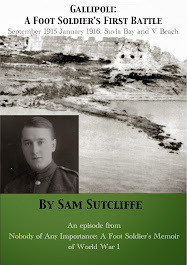 This is very different to the way he writes about other battlefields – in Gallipoli earlier, and subsequent experiences on the Western Front, including his front-line account of fighting against the German Spring Offensive around Arras in March, 1918. When he wrote his story, back in the 1970s, and I first read it, section by section, at his request querying anything I didn’t understand, one of my questions – I still have the handwritten sheets – was “[Writing about the Somme] you cover the general situation but, for once, don’t say what was happening to you – were you in the… advanced trench throughout and therefore a ‘spectator’?… you get personal again in the aftermath, recovering bodies etc, but there is this notable blank on what you were doing at the peak of the action…”. He didn’t answer that question; but then he didn’t answer any of the other far more banal questions on that sheet either and I simply don’t know why not. So my speculation runs from he just didn’t see that sheet of questions for some reason, to the events of that day so shook him that his usual total-recall memory registered very little bar broken fragments, to he did remember but it was so terrible he couldn’t bring himself to write down much of it, to he felt guilty that he could do nothing/did nothing to help his comrades. His A Company, marching Platoon by Platoon at two-minute intervals to minimise shell casualties, led the Battalion from Souastre via the Brigade “equipping dump” at Bayencourt (three kilometres due south, where they gathered ammunition, grenades and picks) to Hébuterne where they arrived in the night, at 12.05am on July 1. His Company moved into front-line trenches designated W47 and W47S facing Gommecourt. The 1/14th London Scottish (my father’s “kilted lads”) had reached their positions to the Kensingtons’ left at 11pm, June 30. At 2.45pm the German artillery began a massive bombardment, wrecking trenches and killing men, to which the British did not respond until the pre-planned time, 6.25am. An hour later, says the WD, “our smoke started” – cover for an infantry advance – and the German barrage resumed maximum intensity. The London Scottish charged out into this maelstrom on schedule at 7.50am. Company A were supposed to follow up soon after with digging parties to construct a new trench through No Man’s Land to the supposedly captured German front line – which the London Scottish had actually achieved at terrible cost. But the Kensingtons’ new CO, Colonel Young, asked Brigade’s permission to hold his men back because the German artillery made static work in No Man’s Land suicidally impossible – Brigade agreed, so my father and his comrades remained in their crumbling trench. The Kensingtons’ WD states that 24 officers and 525 ORs (other ranks) went into battle and the casualty count (dead and wounded) was 17 officers and 310 ORs (59% casualty rate). Pro Patria Mori adds that the London Scottish casualties numbered 14 officers, 575 ORs and 15 Medics (77%), the neighbouring Rangers (1/12th London) 17 officers, 447 ORs (58%), and 1/4th City Of Londons (Royal Fusiliers) 16 officers, 344 ORs (58%). 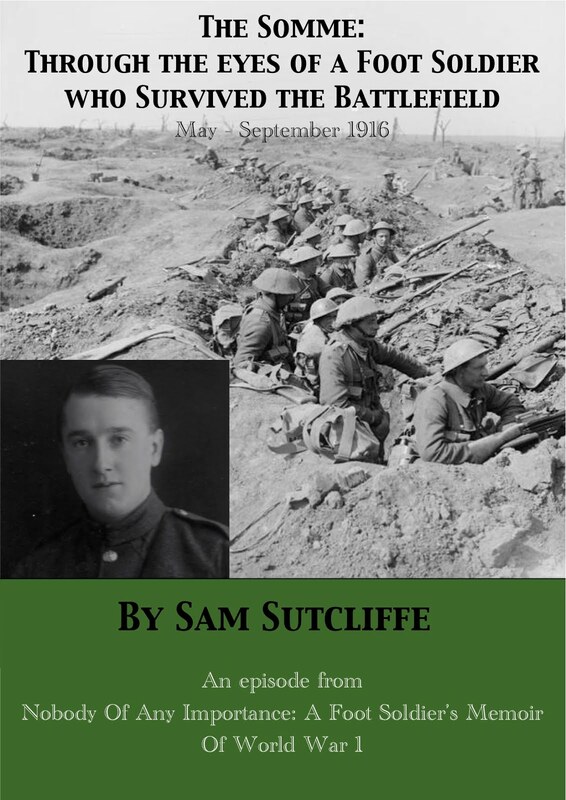 NB: throughout the summer, these blogs will be unusually long, simply because Sam had such vivid memories of, and so much to say about, his experiences a hundred years ago on the Somme. I hope you’ll agree there’s not too much wasted verbiage and plenty of truth and substance.